Through browsing our portfolio you’ll see why our e-commerce web design is second to none. When it comes to eCommerce web design, our technology and creative flair sets the standard for which others can only aspire to. All of the web design e-Commerce solutions we offer are bespoke we would never use or recommend the ‘off the shelf’ software packages. Why? We believe an eCommerce platform should be built around the specific requirements of each individual business, rather than having to ‘work around’ a ready-made package. This means you will get an adaptable website, tailored specifically to meet the needs of your target market, giving you higher conversions, better search engine rankings and most importantly a site that actually sells. e-Commerce website design is essentially your shop window it can entice a customer to take their first step down the buying process and provide reassurance their credit card details are secure. 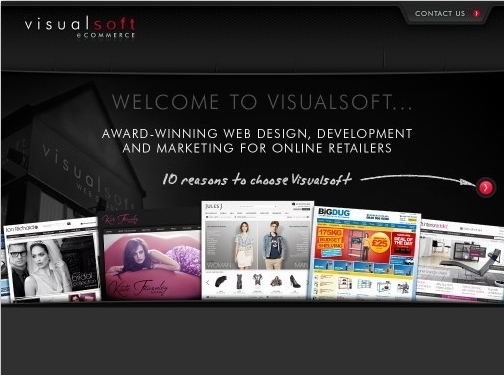 Visualsoft sites are tailored to meet the needs of your specific target market whilst using our knowledge and expertise gained from developing multiple award-winning e-Commerce websites. If you want to be a success online, your website needs to be designed by a team of professionals who know how to create websites that convert. Behind Visualsoft website design sits a powerful eCommerce Platform giving you higher conversion rates and better ranking on search engines. Many of our eCommerce clients have enjoyed a dramatic increase in sales without investing a large amount of money in marketing. How? We provide an eCommerce website that will help convert current visitors who are not buying, as well as a website that will assist in attracting new customers. UK (Stockton-On-Tees) based company offering website development and SEO services. Website features details of their services, porfolio, blog, and full company contact details.